I wasn’t too surprised a couple of weeks ago when Yelp bought SeatMe. I mean, I was surprised they paid 12.7 million for a system with 104 restaurant clients as that comes to about $121k per restaurant. But I was surprised to see Open Table buy Rezbook yesterday. Mostly because with 2000 restaurants and the price per restaurant set by the recent SeatMe purchase implies the going rate would be 242 million. We’ll know the final price tag soon when their quarterly numbers come out, but if Rezbook had 2000 restaurants paying $199 per month, then they should have been generating about 4.7 million per year. That means they wouldn’t let it go for cheap. With SeatMe’s prices likely to change under the Yelp umbrella, eliminating Rezbook means Reservation Genie may become the only reservation system with a public booking community that doesn’t include cover fees for reservations originating from the restaurant’s website or customers who come back to book directly through ours in the future. It means your invoices won’t go up as our booking community gets bigger. This defines what we call a FREE BOOKING COMMUNITY and it should be the deciding factor in determining what reservation system to use for long term viability. We’re hoping restaurants band together to support it as the alternative is a dark cloud of an ever growing cost for reservations as Open Table continues to encourage more customers to book directly through their website and drives them down the very expensive 1000 point table path. The trick to encourage customers to skip the restaurant website and motivate them to book more expensive paths is all in the points system. Yelp site user Pam A. says, “You won’t get points if you book OpenTable reservations through a third party. That includes booking on the restaurant’s website or through Yelp.” Not all users care about points, but in this day and age we all have Open Table and Yelp on our phones. 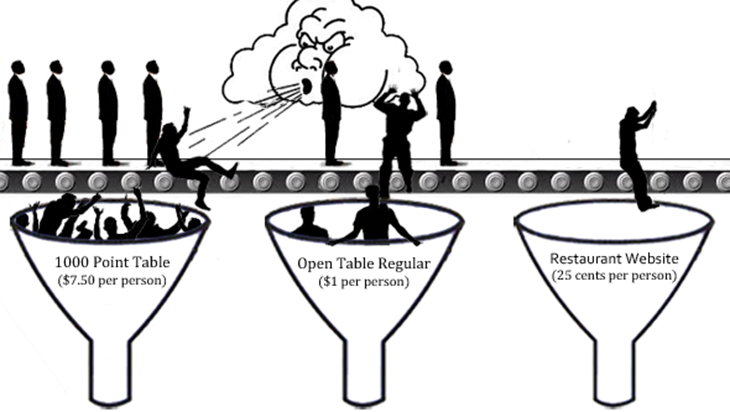 It takes about 10 seconds to see if the restaurant you want is on Open Table. If they’re not, then users just go to the restaurant website and book directly through the alternative. The $1 per person cover fee is enough to see some popular restaurant’s racking up $2000 a month in regular cover fees. Things get really scary in cities where the culinary scene is super competitive. New York City, Los Angeles, San Diego, and Houston all have over 17% of their restaurants using 1000 point tables that cost a whopping 7.50 per cover. As things heat up and it’s harder to get customers those percentages are likely to rise. If Yelp changes the pricing model for Seatme to include cover fees and Rezbook is no longer being offered, there aren’t a lot of sustainable reservation systems left. Reservation Genie uses points and gamification to encourage customers to come back to individual restaurants more often. But we don’t profit from it by charging the restaurant one fee, giving a fraction of it to the customer in gift cards, and then keeping the rest in profit. We let restaurants give perks to loyal customers and then cap how many customers get those perks. It means the transaction is directly between the customer and the restaurant (AS IT SHOULD BE!) That lets a restaurant offer something like a complimentary appetizer. That may cost $15 on the menu which is a better deal than a 1000 point table to the customer. But it only costs the restaurant $5 per reservation in food costs vs 7.50 per person that a 1000 point table represents. Any reservation system that is going to one day compete with Open Table will have to incentivize customers to come back to their site in order to build a booking community. But the trick is making sure the incentive system is sustainable. Ours caters to each restaurant individually as well as the community as a whole. It’s scalable, sustainable, and properly priced. Feel free to offer feedback below and if you’re in the restaurant industry and want to take a look at our model, just schedule a demo so we can take a little time to get to know each other.